In California, Amyris has started industrial scale production of what it believes is “the world’s best tasting and lowest cost zero calorie natural sweetener” and therein lies a tale. Of Amyris and, by extension, almost everyone else who will — soon or later — follow in its wake. Originally, it was going to be fuels, and then there was a period of bulk chemicals around its farnesene production chops — they called it biofene. Take for instance the Vitamin A partnerships with DSM. Amyris had been steaming along with Vitamin E, reporting “that it expects revenue related to its Vitamin E partnership with Nenter to more than double based on the current success of the program. During 2016, the company shipped approximately $9 million of farnesene to Nenter for conversion to Vitamin E and expects 2017 shipments to Nenter to be about $20 million.” Now, along came an exclusive licensing agreement with DSM for Vitamin A within the nutraceuticals market. The focus? A fast-track to market for the production and commercialization of low-cost supply of Vitamin A. But is it all just contract R&D of the old pharma model? “It’s not the pharma model,” Melo said, ”or a change in model or a strategic choice to sell and move to royalty only for Vitamin A. The rest of business is still the value share model. We only do it if we get to scaled manufacture and supply long term, and we share in the value, which is a royalty equivalent in some ways, but we manufacture, we supply, they select. So, now, we have we have 7 scaled-up molecules, all growing at 30 – 40 percent. The Vitamin A opportunity was a bit of an outlier for us. There was this extremely volatile market price, production is very concentrated and we have no impact on that. So, the opportunity for us was to use our technology position to extract as much value from the partnership as we could. But let’s look at one other aspect of the vitamin business — an unusual role for industrial biotechnology, which is to power low-cost manufacturing. You see, it’s unusual for biotech be associated with “low cost” anything. In fuels, it’s been about addressing externalities like emissions, and the product costs the same or more as the incumbent. In chemicals, there were hopes of reducing manufacturing costs, but the crash in oil prices and the long-term cheap natgas prices have limited industrial biotech mostly to markets where there is a functional advantage or where consumer preference opts for the more sustainable option. So, this is different, and one of the two biggest reasons that Amyris is tilting towards China. “We’re focused Zero on North America,” says Melo, commenting on the pharma prospects. “We’ve played around pharma in the US and EU, and it is interesting work but they are just not focused on cost reduction, and that’s where our value proposition is. Sure, there’s purity, but we really deliver on cost reduction where we can simplify a multi-step process that a company is going through to make a molecule using petroleum. That’s where the value is for us — simplifying — and the western companies have a big disconnect with synthetic biology. Take Yifan, for one. World’s biggest supplier of insulin. For them, the issue is the cost base. If you thought that Amyris might ultimately set up a separate company with a couple of new investors and parlay its scars and learning into an accelerated growth path in China, you’d probably not be far off. Faster growth and lower investment could well be expected there, because in many ways the Amyris Mousetrap already exists. Walt Disney’s first 20 years weren’t pretty either, it didn’t get great until 1954 and Disneyland. And, again to quote Sam Nejame, “If you were to look at the performance of bio-pharma equities circa 1990, arguably a similar relative era to today’s Industrial Biotechnology development, you would see something interesting. In fact, for the first 30 years of bio-pharma, that industry burned more money than it made. And if you remove the two superstars (Genentech and Amgen) the numbers look much much worse. Now, back to China, because there’s more to it than cost. We probably can thank Donald Trump for that. The Chinese companies are scrambling, and politics and sustainability are key drivers, and there’s a huge movement towards clean technology. We’re not entirely sure how many companies “get it”, when it comes to China. It’s not the place, really, to go in and pitch the same things the same ways, long-term opportunity, like companies do in the EU. There are a lot of companies pitching, and widely, and they have great technology and great development opportunities. The ability to capitalize on those opportunities with a scaled supply agreement to take full advantage of what’s been built — where that goes, we’ll have to find out. Nejame thinks its hard to make contract R&D plus royalty work without the blockbusters that pharma provides. But we are drifting away from Amyris, and China, and we shouldn’t leave China just yet until we’ve put a circle around that word, sustainability, and how new consumers are entering the market with new ideas on product. Not just the Chinese. Think, Millennials. That generation is between 18 and 34 right now — peak value to many consumer-facing companies. Even the Digest demographics have changed radically. Back in 2007 when we were founded, roughly 13 percent of our readers were Millennials, 47 percent Boomers (and above) and 40 percent GenXers. Today, those percentages are 51 percent, 20 percent and 29 percent. Millennials are taking over the market when it comes to industrial biotechnology. And something else about that group. Among Boomers and older, 85 percent of our readers are guys. In the 18-24 group. we’re 50/50 on gender. Times are changing. So are tastes. The pursuit of the zero-calorie sweetener was supposed to be over years ago. It was sugar, or Equal or NutraSweet or Splenda. The white package or the blue one or the pink or the yellow. But then, consumers rebelled — and there was an interest in more natural solutions. And the stevia plant is amazing. It naturally produces Reb D and Reb M, which are much more concentrated than sugar have no calories. The problem being Reb A, which is also present in the plant and has an unpleasant aftertaste. And it makes all of them in low concentrations. So, a technology that simply crushes stevia and extracts molecules struggles on cost and on performance. Alternatives? So, you try to convert Reb A into more Reb M (Sweegen), or use industrial biotechnology to make Reb M, Reb D or any combination thereof via fermentation of plant sugars. That’s Evolva and Amyris, backed by Cargill and DSM, respectively. The battle is heating up, and the stakes are huge. The players in low-calorie sweeteners are a who’s who. DuPont, Tate & Lyle, ADM, Cargill, Celanese, NutraSweet, and Ingredion. Technavio projected the market to grow to $2.84B by 2021, and a growth clip of 4 percent. Cargill is expected to start at-scale production shortly in its long-standing partnership with Evolva, then there’s Sweegen (which has a technology to convert naturally-extracted Stevia into a better-tasting alternative). 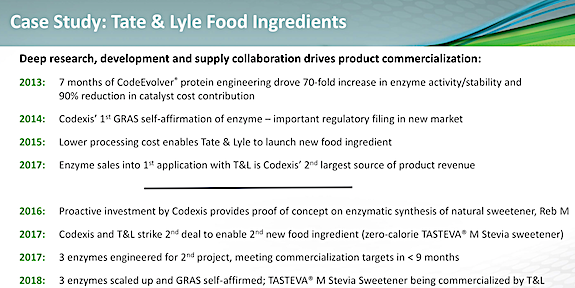 And we would be remiss to overlook Codexis and Tate & Lyle’s partnership. In 2016, about three years after their first partnership (CodeEvolver protein engineering drove a70-fold increase in enzyme activity/stability and 90% reduction in catalyst cost contribution), a proactive investment by Codexis provided proof of concept on enzymatic synthesis of natural sweetener, Reb M. In 2017, Codexis and T&L struck a deal to enable a new food ingredient (zero-calorie Tasteva Stevia sweetener), and T&L is now commercializing. Brava. Now, DSM and Amyris are now entering the fray at commercial-scale. Sweeteners are huge in India, and the country is a rocket So, why do we hear less of Amyris out that way? Reduced costs, reduced calories, reduced carbon, and a smaller world. 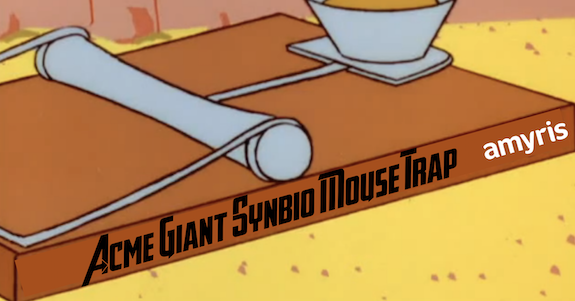 Amyris has build the mousetrap now — we’ll see as the months and years unfold where exactly it will take them. It’s been a bumpy flight, but it looks as though there are enough targets at enough companies to keep Amyris scaling up its R&D and also its manufacturing. The Stock price has been on a rise these past 18 months, too — welcome news. Will Amyris be able to fund all its growth without dilutive share issues, now? We’ll wait to see. But for sure, the partners and the products would convince anyone that the next few years promise to be a real journey into opportunity. Think China, nutrition, beauty for now. As carbon policy comes together and petroleum prices rise — more doors will open.